Scheduling lessons with our booking system is very easy. Use the booking guide to learn how to buy a pack of lessons, and also how to book, cancel or reschedule your lessons. 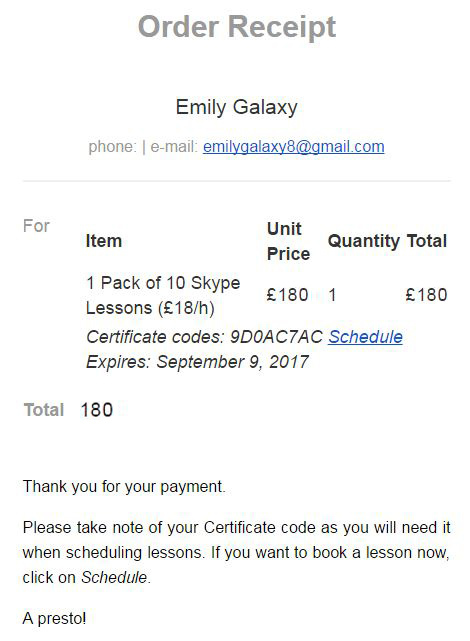 Go to our Booking Page and click on the type of lesson you want to try (Free Skype Lesson / 15% off Face-to-Face Lesson). Fill in the Contact Form in order to give us some information about your availability, Italian level, individual needs, etc. and click on Send. Once we receive your contact form, we will send you a confirmation email as soon as we find a suitable tutor for you. In the email you will find more information about how to schedule your trial lesson. 1. Go to our Price List and select the pack of lessons you want to buy. You will be able to choose between Skype lessons and face-to-face lessons. 3. Double check the item in your cart and click Complete Order. You can pay directly with your credit/debit card. 4. Once you have made your payment, you will receive a confirmation email with a Pack Code to redeem your pack of lessons, the expiration date of the pack, and a link to where you can schedule your lessons. 1. If you haven’t bought a pack of lessons yet, please read the section “how to buy a pack of lessons” above. If you have already bought it, and want to schedule a lesson, go to the purchase confirmation email we sent you when you bought your pack and click on Schedule. Please keep in mind that lessons must be scheduled at least 24 hours beforehand. 2. Select the kind of lesson you want to schedule. 4. Remember to set you time zone. This is usually detected automatically, so just double check and then click on set time zone. 5a. A calendar with your tutor’s availability will open. Choose a date and a time that suit you best. If you want to schedule only one lesson, click on Continue. 5b. If you want to schedule several lessons, click on Recurring. Another window will open and you will have two options: you may schedule recurring lessons, if you want to have lesson on the same day at the same time every week by clicking on Add Recurring Times, or you may also schedule other lessons for different days at a different time by clicking on Choose additional time. Once you have finished, click on Continue. 6. Enter your contact information, your Pack Code, and click on Complete Appointment. 7. Once you have completed your booking, you can add it to your iCal, Outlook or Google Calendar through the confirmation page, and also through the confirmation email you will receive after scheduling your lesson. In this way, you won’t forget it! In addition, you will receive a reminder email 24 hours before your class. 8. On the confirmation page, you will see that it is possible to register for an account, which will help you to manage your bookings more easily. If you want to schedule a lesson through your account, click on “log in” on the upper right hand side of our website, and enter your email and password. Then, click on “enter your Pack Code/Voucher here” and enter your pack code or email in order to redeem your pack of lessons. Just follow the easy steps as explained above in order to complete your booking. You have three different options to cancel and reschedule your lessons. Option A. You can cancel and reschedule your lessons through the confirmation emails you received when you made your bookings. Option B. If you have already registered for an account, just log in on the upper right hand side of our website. Once you are logged in, you will be able to cancel and reschedule your lessons very easily by clicking on Cancel or Reschedule. Option C. If you used the Add to Calendar option when you scheduled your lessons and added them to your Google, Outlook or iCal Calendar, just open your Calendar, click on the lesson you want to cancel or reschedule, and you will automatically access the rescheduling/cancellation page. Please, keep in mind that lessons can be cancelled and rescheduled provided you give 24 HOURS’ NOTICE. Registering for an account will help you to manage your bookings directly via the website; otherwise, you will have to do it through your purchase confirmation email. 2. Click on the “Register for an account” button on the confirmation page. 3. Insert a username and a password (please note that only a valid email address can be used as your username). 4. Click on Sign up. If you have already signed up and have forgotten your password, you can reset it here.